Homes located around Rio Del Mar are surrounded by very lush and wooded areas. Many Rio Del Mar homes are tucked away amidst fertile Pine, Oak and Eucalyptus trees. The large amounts of foliage makes roof and gutter cleaning an essential part of maintaining your home. Roof clearing makes sure your roof top is clear of fallen debris and is always the first step before cleaning out gutters and flushing downspouts. Not only is roof clearing and gutter cleaning an essential part of preventing water damage but is also highly recommended for creating a defensible space for wild fire preparations by Cal-Fire. We recommend that Rio Del Mar home owners have their roof and rain gutters cleaned at least once annually. Some homes located up places like Trout Gulch Rd, Valencia Rd, and Aptos Creek Rd might prefer having roof and gutter cleaning done twice a year as conditions are a bit more extreme. Remember, in these highly wooded areas, roof and gutter cleaning is especially important, not only to prevent water damage, but for wild fire preparations. We recommend Having your roof and gutters cleaned around the month of October as Rio Del Mar and the rest of the States usually receives it's first rains. 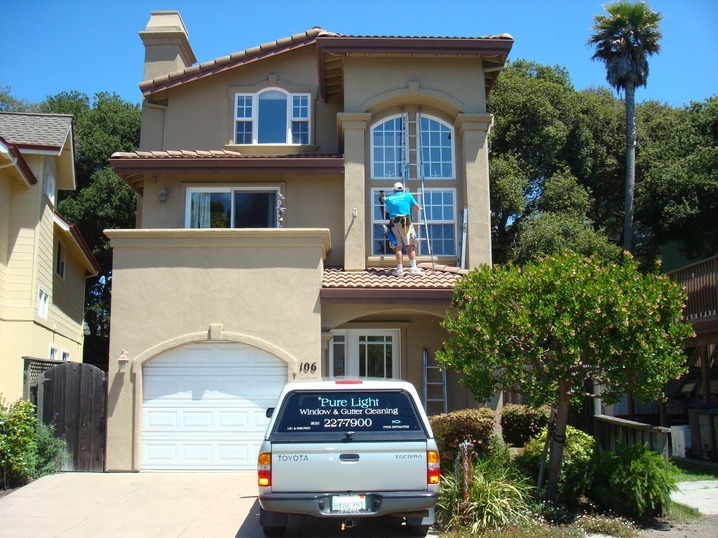 Pure Light Window & Gutter Cleaning Service has been providing professional roof and gutter cleaning services to Rio Del Mar and Aptos for over 18 years. We love our community and are here to serve you. Estimates are always Free, so give us a call today.